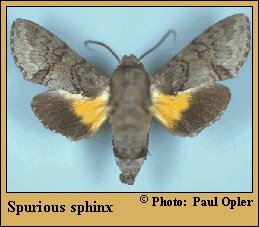 Identification: Forewing upperside is pale silvery gray with black markings; in some moths the wing base may be very dark. Hindwing upperside is deep yellow with a black border that covers more than half the wing. Wing Span: 1 3/8 - 1 3/4 inches (3.5 - 4.5 cm). Flight: . Several flights throughout the year in South Texas. Range: Mexico north to South Texas and Oklahoma. NCGR: GU - Unable to assign rank due to lack of available information.